At QCon London, David Farley (@davefarley77) told the audience that “continuous delivery changes the economics of software delivery”. I could not agree more. In their book, they also provide insight to continuous delivery tool chains and processes which highlight build tools, CI platforms, testing suites, artifact repositories, and many other components. There are numerous examples of reference architectures available, and each of them vary in levels of detail, tools highlighted, and processes followed. Yet, there is a constant theme among the tool sets: Jenkins, Maven, Nexus, Subversion, Git, Docker, Puppet/Chef, Rundeck, and Sonar seem to show up time and again. 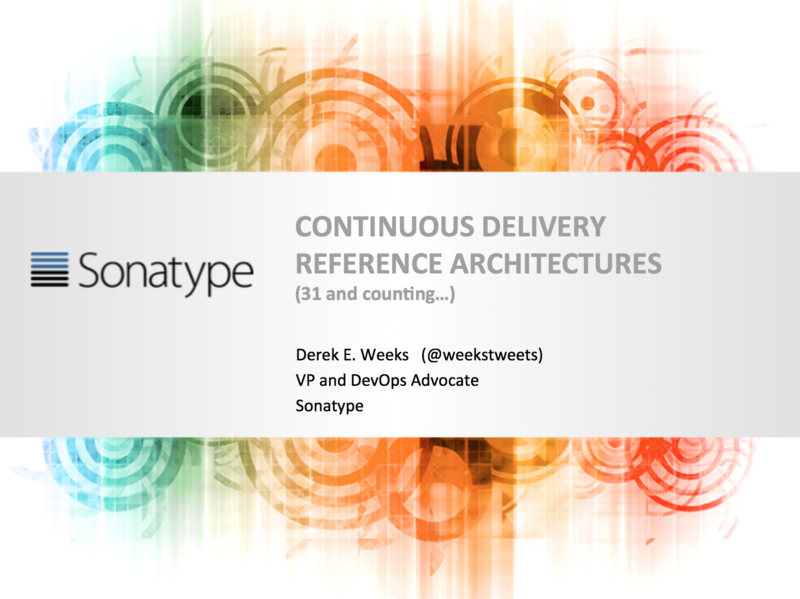 To help you along your continuous delivery and DevOps journey, I have compiled a set of 31 reference architectures created by users across the continuous delivery and DevOps communities. You can view the deck here, and can download the full deck (no registration required) from SlideShare.com. Each architecture is accompanied by a link to the original presentation or blog where the architecture was referenced to ensure you have access to the full context of the discussion. You can also freely download the presentation from SlideShare where we now have over 7,000 views. Offer to help others: If you have a reference architecture to share, please consider posting a link to it in the comments section below. I am sure others would love to see it and learn from it. What Does DevOps 2.0 Look Like?